The Carrol Boyes range is renowned for the unique way in which it combines form and functionality. 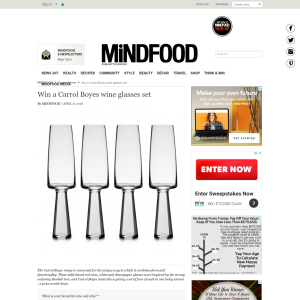 These solid-based red wine, white and champagne glasses were inspired by the strong, enduring Baobab tree, and Carrol Boyes Australia is giving a set of four of each to one lucky winner - a prize worth $240. To enter, individuals must, during the competition period, visit www.mindfood.com follow the prompts on the competition entry page, input the requested details including the answer in 25 words or less to the following question “What is your favourite wine and why?” and submit the fully completed entry form. The Promoter has One Carrol Boyes set to give away, valued at $240. Total prize value is $240. Prizes are not transferable or exchangeable and cannot be taken as cash.